ANCHORS Anchors can be defined by their stowage locations aboard ship or by their type of construction. Bower anchors are carried on the bow and are secured (housed) in the hawsepipes. Stern anchors are carried on the stern. On landing ships and craft, stern anchors are secured to the stern and are used to help pull away from beaches. The most common types of anchors used aboard ship are the stockless and the lightweight (or stock-in-crown) anchors. 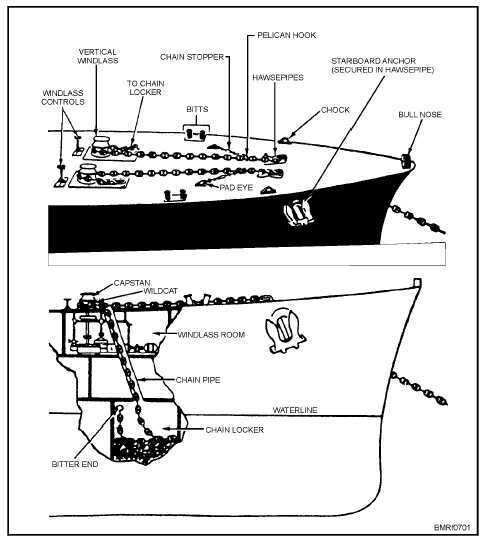 The two anchors shown in figure 7-2 are of Navy design. The stockless types are used chiefly as bow anchors (bowers) on most Navy ships. Originally, the lightweight types were used only on small boats and as stern anchors of landing ships and craft. However, recently they are carried as bowers for several types of vessels. ANCHOR CHAIN Modern Navy anchor chain consists of studded links of high strength steel. (Studs are crosspieces of metal forged or welded in the center of the links to prevent the chain from kinking.) Chains are made up of 15-fathom (90-foot) sections called standard shots. The number of shots per chain depends on the size of the ship. Shots are secured together by detachable links that 7-2 Student Notes: Figure 7-1.Typical ground tackle and chain stowage.